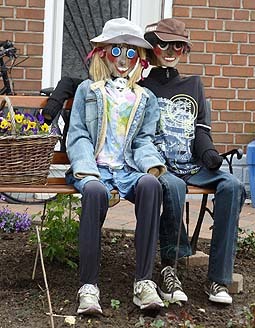 This delightful pair of scarecrows was sitting in a garden in Bailleul, France. 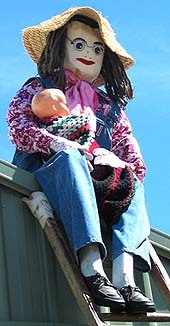 Here is Ma and her baby sitting on a shed roof at the Kurrajong Scarecrow Festival -- They were sheltering up there from a 'bush fire' as part of the Strawy Fire Brigade scarecrow show. 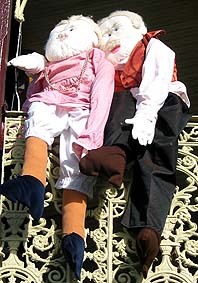 Grandma and Grandpa scarecrow were perched on a top floor balcony in this scarecrow idea at Milton Scarecrow Festival. 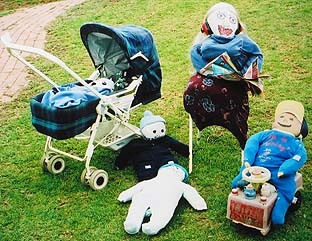 This scarecrow display idea showed Mom scarecrow and all the kids enjoying the sunshine -- a happy scarecrow family. 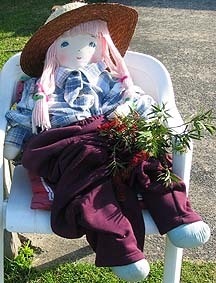 This little scarecrow girl had a beautiful embroidered face and pretty wool hair. This little scarecrow girl was dressed as a ballerina. 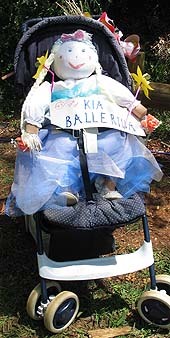 She had long plaits and a gauze skirt and was efficiently transported to the festival in a stroller. 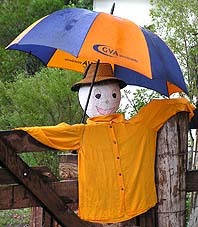 This happy scarecrow boy with his colourful umbrella had a head based on a balloon lightly covered with paper mache. 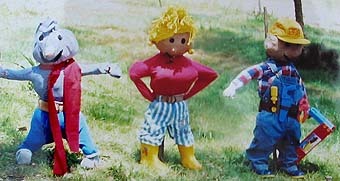 These three pint-sized scarecrows made an attractive group display. 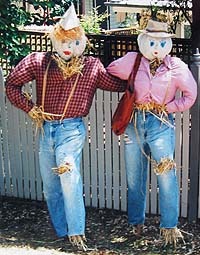 Here is another happy couple of scarecrows stepping out for the day. Note: This page includes kid, parent and grandparent scarecrow ideas for you and your kids to make building a scarecrow family theme: mother and child scare crows, grandparent scarecrows and scarcrows of boys, girls and groups of good friends.